This is one of our favorite pork recipes. It is actually a braise, despite the title. It has incredible flavor for the minimal number of ingredients, and leftovers make great open-faced sandwiches. 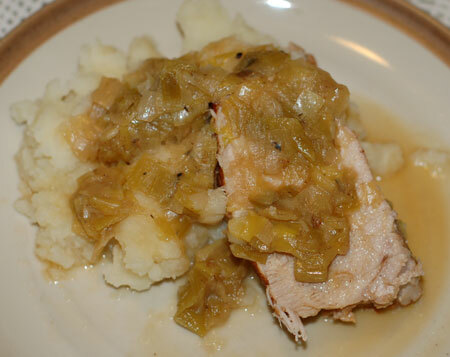 We usually serve with mashed potatoes as an additional carrier for the leek sauce. Remove roots and tough upper leaves from leeks; reserve for making stock. Cut each leek in half lengthwise. Cut each half crosswise into 1/2-inch-thick slices (you should have about 6 cups). Soak in cold water to loosen dirt; rinse and drain. Heat the leek, 1/2 C water, 1 tsp butter, 1/4 tsp salt, and 1/4 tsp pepper in a large Dutch oven or deep saute pan over medium-high heat. Cook for 10 minutes or until the leek has wilted. Pour into a bowl. Heat 2 tsp butter in pan over medium-high heat. Add pork; cook 5 minutes, browning on all sides. Add 1/4 tsp salt, 1/4 tsp pepper, and wine; cook 15 seconds, scraping pan to loosen browned bits. Return leek mixture to pan. Cover, reduce heat, and simmer 2 hours or until pork is tender. Remove pork from pan; increase heat to reduce leek sauce if watery. Cut pork into 1/4-inch-thick slices. Serve with leek mixture; garnish with parsley, if desired. Update 8/7/07: We had a friend come over to watch movies with us on Tuesday, and Jeremy requested I make my leeky pork for the occasion. I was happy to oblige, using 2 pork tenderloins procured from Costco and some organic leeks from the farmer’s market. Served with egg noodles because we didn’t have enough potatoes on hand, and they are definitely inferior to mashers for this dish. Still, everything came out beautifully tender and flavorful, as always, and was heartily appreciated by the guys.